I attended the first ever Texas Linux Fest right here in Austin this past Saturday, April 10, 2010. My compliments go to the organizers of the event! They were able to pull off this excellent event in the face of many naysayers. Congratulations, guys, it was an outstanding Linux conference, and I'm looking forward to it again next year. 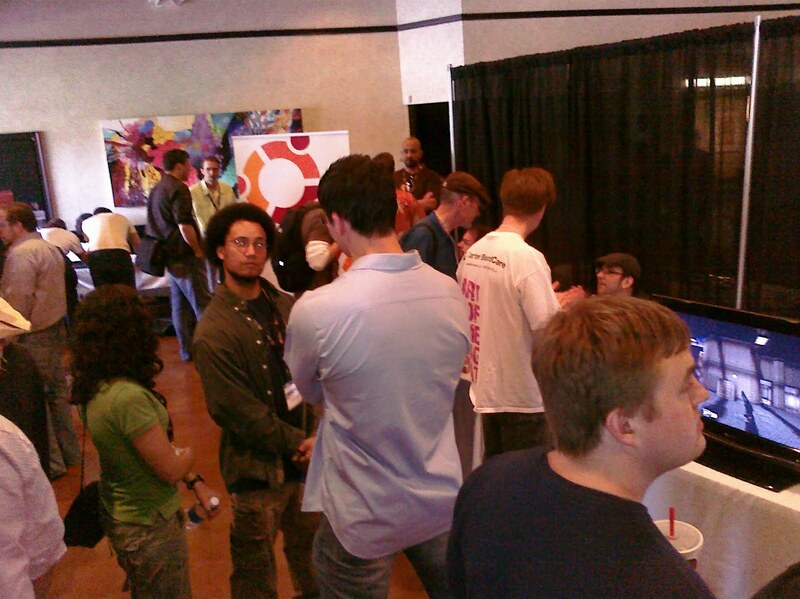 Canonical had ample representation, and the Ubuntu booths (one Canonical, one LoCo) were very heavily visited. Jeremy Foshee was the hero of the Canonical booth over the course of the day. 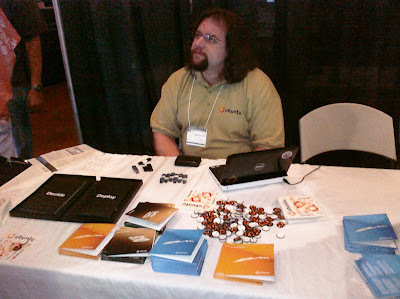 JFo's mouth was running about Ubuntu for a solid 8 hours ;-) We gave away several boxes of 9.10 Desktop and Server CDs, and hundreds of stickers and pins. Meanwhile, I was working on a dry run of my presentation slated for later in the day. I decided to use the Lucid daily server image, rather than the Beta2 image because there was a bugfix I wanted for the sake of my installation. I attended a talk by Jeff Gehlbach on OpenNMS, a tool for monitoring Linux systems on a very large scale basis. Looks like a pretty interesting tool. We should perhaps package this for Debian and Ubuntu. And then I listened to Chip Rosenthal's talk on hosting your own mail server (and "saying goodbye to Gmail"). This was a good talk. 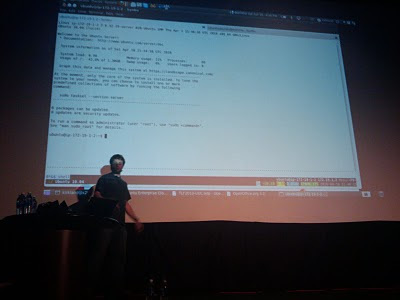 Chip started with his age-old mail solution (mutt running inside of a screen session on his server at home). And then showed his Palm Pre -- the first Linux smart phone he's ever owned (same phone I use). The Pre has terminal and ssh application, but the size and format of the interface just doesn't lend itself to mutt. So he built his own mailserver, using Ubuntu and dovecot. I didn't learn anything earthshattering here, but I thought his talk was an excellent showcase for the Ubuntu Server and dovecot. After lunch, I attended a talk about Ubuntu on ARM, by Canonical's Pete Graner and David Mandala. I learned quite a bit, actually. The ARM space is quite challenging, giving the fragmentation of the architecture, with each vendor making their own strange customizations to the design. The revisions are happening quite fast, which makes it very challenging for Ubuntu, as a distro, to keep up. Next I learned about Drizzle from Monty Taylor. Drizzle is a fork of MySQL by a number of former MySQL developers (who appear to be fairly frustrated with Sun and now Oracle's handling of MySQL). From Monty's talk, Drizzle is by design quite pluggable and extensible. I noticed that we have several Drizzle libraries in Ubuntu already. I'm going to take a closer look at these at some point. All in all, I was pleased. It all worked ;-) I think I successfully moved the VGA cable 7 times among 3 laptops during the course of the presentation (thanks Bryce!). And a big thanks to my wife, Kim, who came and sat in the back row. She initially called it Nerdapalooza :-) but she said she had a good time and gained new appreciation for the importance of the work that we do in the Free Software world. Jon "maddog" Hall followed my presentation, talking about Project Caua -- an interesting idea about bringing the Internet to masses of poor people in densely populated urban settings such as Sao Paulo, Brazil, using Linux servers, thin clients, and desktop virtualization. I think Ubuntu has all the tools that Maddog needs to make this work. I really hope it takes off. Randal Schwartz delivered the closing keynote. His talk was highly entertaining, and shared many interesting anecdotes about his experiences with Larry Wall, Linus Torvalds, and Richard Stallman. It was a good "motivational" talk, in that he encouraged many of the non-technical attendees to get involved in Open Source through non-traditional means. He also distanced himself from (his words...) "FSF Hard Liners", claiming to be a more practical guy. When talking about making money off of open source, he said something that really hit home for me...he said that even if he were filthy rich, he'd probably wake up and do the same thing everyday -- answer a bunch of emails and questions on mailing lists, maybe hack a little, etc. I was disappointed that he claimed to actually not even run Linux at all (his slides were on a Mac, running OSX). I guess I could have done without that detail about the Texas Linux Fest's closing keynote speaker. Oh well. Other than that, it was a great day. Again, thanks to the sponsors and organizers of the TLF. Here's to doing it again next year! Ubuntu is U2 now in Joe's talk. Thanks for this as I was unable to attend I appreciate hearing your rundown of the whole thing , cheers. WordPress is open source and since you can export all your posts and comments, I don't see why using WordPress (whether self-hosted or not) would be a problem for an open source fan. "more staying power than a bad 80's fad"
U2? Dang, when I saw Zonker last I tried to convince him we were Led Zeppelin. So much for that! When the geeks get together, the earth shall rock and roll. As I said, I'm a practical guy. I run OSX, because you have to admit that OSX on Apple hardware is a hard-to-beat combination. I *do* run lots of open source on my laptop, and always prefer open source to closed source all other things being equal. I'm just not willing to sacrifice my productivity for a "cause". Yep, yep, I hear you about being practical. I liked that part about your talk. However, I'm not a Mac user, so I can't admit that OSX is better on Apple hardware. But whatever makes you happy, and feel free. Enjoyed your talk, thanks for dropping by here. I'm student of engineering from India. I'm doing my project on cloud computing and i have set-up a private cloud using ubuntu 10.04 and eucalyptus. My project is to improve server performance of the cloud by changing its scheduling policy. By default the scheduling policy of my cloud is "Round Robin". Can i change this scheduling policy? I'd be glad if i could receive help of any kind.